Four wheel drive. I do not get stuck. I love Chevy period. It is a good solid vehicle. Runs well and rides well. Problem with the 2004 is the cluster panel. This involves your speed limit and your gas gauge, amongst a few other things. It is a bit costly to fix, but well worth being repaired. We have taken several trips in this vehicle and it has always been reliable. It gets me through the snow because of it being 4 wheel drive. It is a 6 cylinder, so it is very good on gas for being a bigger vehicle. I do not know how I am going to write 250 words about this vehicle without babbling about the same thing over and over. Chevy is a good vehicle no matter what model it is. I have had about 8 to 10 vehicles through my life and the majority of them being a Chevy. I prefer a Chevy because of the solidarity of the vehicle. My vehicle is 14 years old and I love it. I love the color, the style and the way it rides on the road. It has an excellent passing gear. It is roomy, as I said we have taken several trips and this vehicle can hold a lot of gear. It has a rack on the top for more gear. I have never hauled anything on the back, but I am confident that I know this vehicle could handle it. I really hope that I have explained this well enough. Chevy is number one in my book. Green and gold SUV with good gas mileage and has a sunroof. I love my Chevrolet trailblazer because it has not given me a lot of problems. We saw this trailblazer on the lot and fell in love with it seeing it was green and gold in color. We are packer fans after all. I am short and I sit up pretty high and that is another reason I like this vehicle. It has a lot of room that we can pack a lot of stuff in there seeing we are camping people. We also pull all terrain vehicles with it with ease. We have at this time a little more than one hundred sixty-six thousand five hundred miles on this vehicle. We can carry five grown ups in this SUV comfortably. It rides very comfortable. We also have a sunroof that I really wanted. We did have to replace the transmission about two years ago. We regularly have the oil changed, about every three thousand miles. My Chevy Trailblazer is 14 years old, heading towards 200,000 miles and still runs great! This vehicle has been very dependable and I have had remarkably few problems with it; generally it's been the type of issues that are routine and comes with age (brakes replacement for example). I love the size -- large but not so big it's hard to manage--, and that I sit high off the ground. I also like the Chevrolet brand and that it's American made. My only significant issue is that it's beginning to rust, which I honestly don't believe is the fault of this vehicle because, after all, it's 14 years old, has a lot of miles and I live in Minnesota with it's long winters with a lot of snow and salt from the roads. I'm disappointed because I'm hoping to drive it for many more miles! 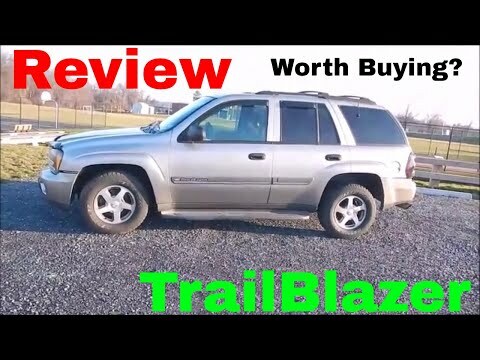 Watch This BEFORE You Buy A Chevy TrailBlazer - Should You Buy One? ON CERTAIN SPORT UTILITY VEHICLES, VIBRATION AND HEAT MAY CAUSE THE TAIL LAMP/STOP LAMP BULB TO LOOSEN IN ITS SOCKET. IF THIS OCCURS, THE BULB MAY FLICKER AND EVENTUALLY BECOME INOPERATIVE. AN INOPERATIVE BRAKE LAMP WILL NOT CONVEY THE DRIVER'S INTENTION OF STOPPING TO DRIVERS IN FOLLOWING VEHICLES, AND AN INOPERATIVE REAR TURN SIGNAL LAMP WILL NOT CONVEY THE DRIVER'S INTENTION TO TURN TO DRIVERS IN FOLLOWING VEHICLES. BOTH OF THESE FAILURES CAN INCREASE THE RISK OF A CRASH. DEALERS WILL INSPECT THE TAIL LAMP/STOP LAMP ASSEMBLIES, AND IF NECESSARY, REPLACE THEM. THE RECALL BEGAN ON NOVEMBER 22, 2004. OWNERS SHOULD CONTACT CHEVROLET AT 1-800-630-2438, OLDSMOBILE AT 1-800-630-6537, BUICK AT 1-866-608-8080, OR GMC AT 1-866-996-9463.